Originally posted by Soren Johnson on the Mohawk Games blog. Offworld shipped three weeks ago, so it’s a good time to roundup some of our best reviews! Civilization IV – the greatest strategy game ever made – was Offworld creator Soren Johnson’s first commercial games as a lead designer. Offworld Trading Company is an entirely different proposition: short-form rather than ultra-long-form, real-time rather than turn-based, sci-fi rather than history. Its surface complexity and basis in economics rather than war and culture make it a less immediately attractive game than Civ, but it’s an exceedingly intelligent game. I haven’t even mentioned the different challenges offered by each of the four factions. There’s so much to analyse that I could write another couple of thousand words, but you don’t need to know everything. What you need to know is that Mohawk have made a game that creates tension and ruthless competition out of a screen of ever-changing numbers. Every victory feels hard-earned and every defeat can be traced back to specific twists in the tale, and in each of its half hour sessions, there are as many twists as in Civ’s six thousand years. At which point, it is the exact opposite of boring. It is every bit as thrilling as something with constant explosions. It’s the sort of game you’ll be thinking about at work. It’s the sort of game you just might want to try online. It’s the sort of game with a campaign you can play and replay and replay some more. It’s the sort of game with so many settings and options and variables that you might never need another RTS. Okay, maybe you’ll occasionally need your fix of one of those less interesting RTSs with tanks or a MOBA with fireball spells or whatever. But Offworld Trading Company is the sort of game that isn’t going to let go of you for a long, long time. I had feared, when I started, that Offworld Trading Company would wear thin after a few games. But that moment never came. I still find every match exhilarating. From the time I bought stock in my opponents, sold them quickly to crash the price and then bought them out a few seconds later, to the time when I managed to keep three launch pads going all at once to reach stupendous riches, every game is memorable. Each map is randomly generated, and with four factions that have distinct strategies that all work with different resource distribution patterns, even the opening is never quite the same. Echoing the classic Civilization question of whether it’s best to found your nascent country where your settler begins or to explore for better options, you’ll only be able to see certain parts of the map at first. You can either scan for better drop locations, or take what you see. But if you wait, another company can claim vital real estate before you, and you may find yourself with precious few options for critical resources later in the game. Every moment from that initial decision until the final stock purchase is incredible. I haven’t even scratched the surface of all that you can do here. It’s a bit chilling to think that in Offworld you’re playing out the same obsessive pursuit of capitalism that led to the fall of its fictional Earth–an event hinted at in tutorial dialogue–yet it’s so recklessly entertaining and biting with its satire that I couldn’t help but get lost. 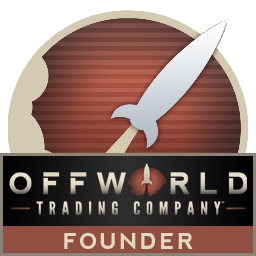 When combined with truly deep and intricate strategic options, Offworld is a revelation. It’s almost unparalleled in the genre. Each and every game is thrilling. Every moment is a challenge. And the brutality of the free market ensures that you can never rest on your laurels, less you be quashed by the invisible hand. Offworld is meant to play much faster than the average RTS, though. Skirmishes can run 20 or 30 minutes. Maybe up to an hour if I can’t get my act together. The campaign is broken down into several stages, each one also hovering around that 30-minute mark, but moving on to the next stage and objective before you get too entrenched in any one map. I’m sure there’s balancing and rebalancing and buffing and nerfing that needs to happen. Somewhere buried in the spreadsheets are some sneaky little “errors” that require tweaking from the developer. But Offworld Trading Companymanufactures a variety of gameplay styles, beckoning you into trying several kinds. Just when you’re getting comfy,Offworld introduces a new set of win conditions and along-the-way hindrances (and, again, opportunities) to keep the maps and scenarios worth playing and replaying. And for a game purportedly about numbers, it can feel like the boxing gloves have come off and you’re fighting for your life. At least in a businesslike fashion. This is full-contact economics 101. Offworld Trading Company is a savage game, as immediate and competitive as Street Fighter. The slightly depressing revelation is that our chief human exports to Mars are capitalism and an endless capacity for consuming each other. There are no tanks or troops, though. Your weapons are price fixing and corporate espionage. Your ultimate goal isn’t to destroy your opponent, but absorb them via hostile takeover. It’s different from more leisurely strategy games in that it’s short form—games can be over at any stage, resources allowing—and if you just feel like laying back and colonising Mars, you’ll simply get devoured. This isn’t an RTS with the combat removed – it’s Wall Street on a new frontier. It kept me engaged because every choice is part of an ongoing battle. It’s impressive that a pillar of fluctuating numbers can be so captivating. It’s a difficult, cerebral game, dense with rapidly shifting complexities and massive swings in advantage. There’s a pretty thorough set of tutorials which do a decent job of explaining the basic mechanics, but once the training wheels come off and you’re exposed to the full force of the free market, it quickly becomes clear that there are few prisoners in finance. The AI becomes brutally efficient very quickly, executing strategies with a sometimes unfair alacrity and grace, seeing the all of the numbers at once in a way unparalleled by all but the most specific of human minds. Online play can be a bloodbath, too, as skilled operators rapidly extinguish their less adept fellows in fell swoops which can easily blindside even experienced players who lapse in concentration. Everything moves very quickly and very precisely. The central economic model at the core of experience performs impeccably, and never once does it feel unfair. I often found myself mystified as to which part of the the process I’d fudged, which column I’d failed to account for, but I never once doubted that I’d deserved it.